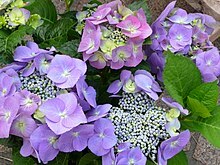 Hydrangea (common name hydrangea) is a genus o 70–75 species o flouerin plants native tae soothren an eastren Asie (Cheenae, Japan, Korea, the Himalayas, an Indonesie) an Americae. Bi far the greatest species diversity is in eastren Asie, notably Cheenae, Japan, an Korea. Maist are shrubs 1 tae 3 meters taw, but some are smaw trees, an ithers lianas reachin up tae 30 m (98 ft) bi climbin up trees. Thay can be either deciduous or evergreen, tho the widely cultivatit temperate species are aw deciduous. This page wis last eeditit on 23 Apryle 2018, at 21:07.